Katy here, and I enjoy making Halloween cards. This spooky house is super fun to create with. This cool haunted house and other very cool spooky stamps can be found at the Great Impressions Online Store! 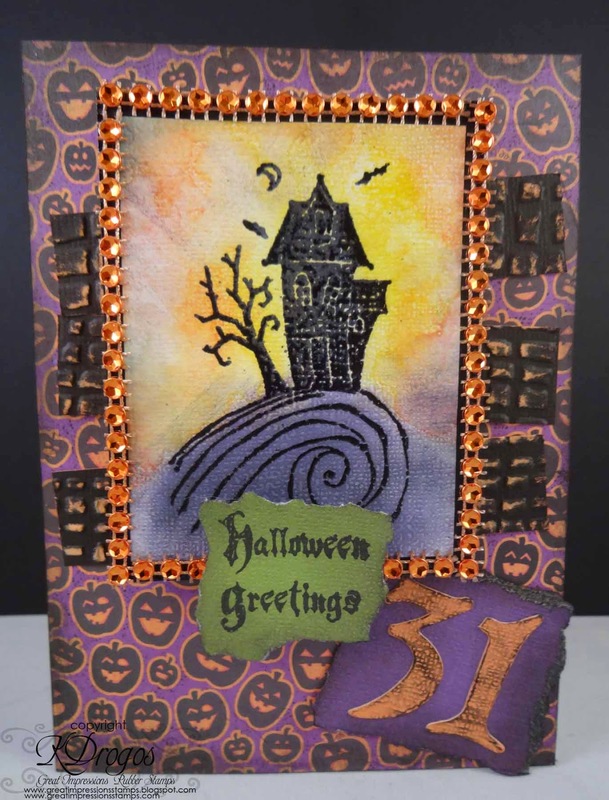 For the focal stamp I used F561 Haunted House and the greeting is A134 Halloween Greetings. I used a die cut for the 31 and used gems around the house. Under the house I cut strips of paper that after I embossed it, I sandpapered it to reveal the orange core underneath. Fun design! Love the bling around the image! Die Versions + Great Impressions: A Blog Hop! Friday Fun with a Little Witches' Brew! September Challenge: Get Your Spook On!